This month's box was pretty sweet! It seemed like the box felt fuller this month than last month, but that may be just me. I did enjoy that the hype leading up to this month's box gave legitimacy to it's contents, sharing Sweet Pete's and all. This month's exclusive build was pretty good! I liked the number of pieces included (all 100% genuine LEGO bricks, by the way), and the instructions were clear and easy to read. The end result of the build is definitely way out of scale with mini figures, but I'm okay with that. 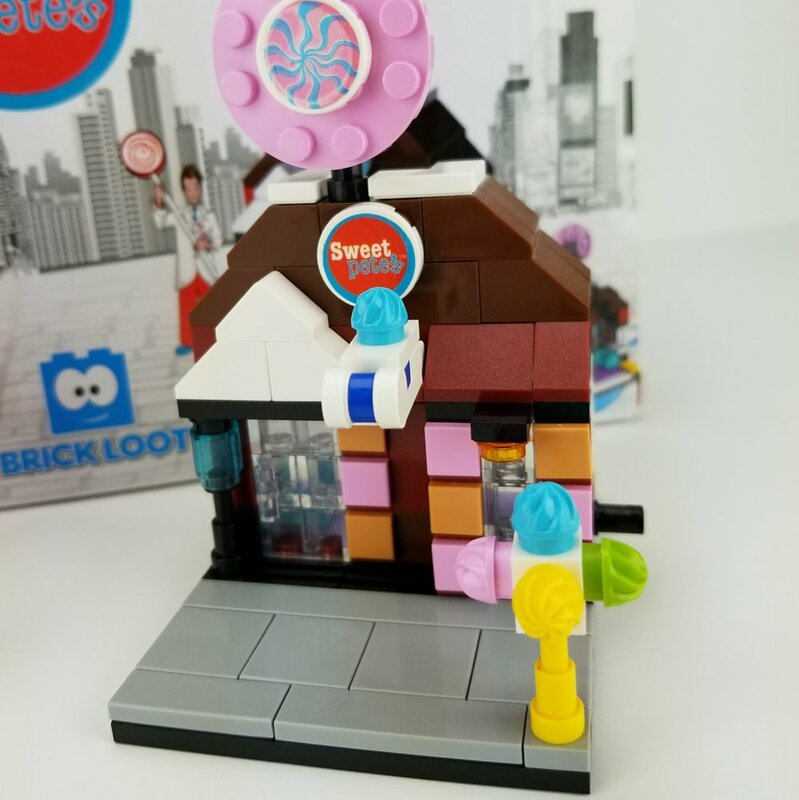 The only complaint I have about this build is that the stickers that were included (the "cotton candy" labels on the 2x4 tiles). These stickers were about 1 or 2 mm too wide for the tiles, making them overhang from the edge just a little. A minor complaint, but a solid one at that. I'm assuming based on the 1x2 technic bricks with technic pin holes on either side of this build (one with a technic pin in it) that it's intended to be a miniature modular system. I have to attach it to the haunted mansion from last month's box to confirm, but this seems to be a consistent element to these boxes. If so, I can't wait to keep getting them and continue building up a miniature city! Something that surprised me a little was the fact that these were not LEGO bricks. They were some sort of off brand building block. It shouldn't have surprised me, however, as Brick Loot never claims to have 100% actual LEGO products in their boxes. I'm totally fine with this, as long as it's still good quality, which it was. These bricks (as much as I hate to admit it) feel almost more durable than LEGO bricks. A little thicker too, for some reason. Unfortunately the off brand nature of these bricks did rear it's ugly head just a smidge, as the white 2x2 round tile (the one with the Sweet Pete's sticker on it) had a little bit of mold flashing on the bottom edge of the piece, sticking out and creating a sharp edge. This was the only issue I had with this build though, and that was easily hidden by mounting the piece with the flashing facing downward, where the molding imperfection will hardly ever be seen. This month's custom minifig was leaps and bounds cooler than last month's in my opinion. This one is the man himself, Pete, from Sweet Pete's. The pieces are 100% actual LEGO, and the printing is not only superb, but it wraps around ALL four sides of the leg assembly. Top notch Brick Loot, top notch. They did a fantastic job of representing Pete, and I'm proud to own this minifig version of him. Also included in the set was a nicely printed set of candies for Pete to hold. I don't have a picture here of them, but definitely check those out in my video below. This month's box felt like I got much more of my money's worth out of it than I did last month. There were more builds, more cool accessories, and more variety of items, while keeping with the theme of the box. I highly recomment checking out my video below, since I didn't cover everything that came in the box in this post. There were more items that are worth checking out. I can't wait for next month's box. The theme is "Bricks Rock", and I'm SO looking forward to see what cool rock related items they'll throw in there! If you'd like to order next month's box while you still can, click the link below to place your order!